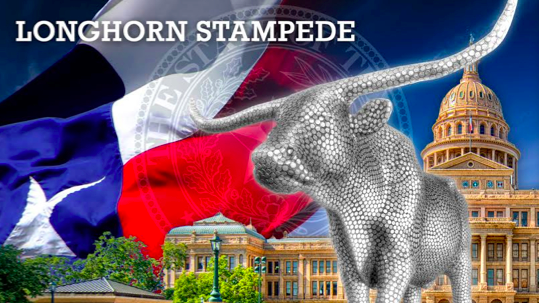 For the joint fundraising effort of actor Matthew McConaughey, recording artist Jack Ingram, and Texas coaching legend Mack Brown, it was announced that philanthropist Milton Verret will create the Longhorn Stampede. The Longhorn Stampede is an auction of life-size fiberglass longhorns designed by several of the most famous and talented artists in Central Texas. How cool is that? Philanthropist Milton Verret, the man behind the huge Gibson guitars and 2011 Cow Parade, is producing the Longhorn Stampede. This announcement foreshadows the actual unveiling of the artwork to take place on Friday, April 25, at the ACL Moody Theater as the opening event for Mack, Jack & McConaughey’s two-day fundraising event. The life-size longhorn cattle statues, which most of you have seen around the city of Austin, double as both a blank canvas for artists and a live auction fundraising object for charity. This year the MJ&M Foundation is thrilled to see what artists come up with and they’re even more excited, of course, to raise thousands of dollars for various philanthropies. Of course you want one, too. Every year, MJ&M will support select non-profit organizations that share the principals’ goal to empower kids. To attend the Longhorn Stampede live auction, you must purchase a ticket to the Jack and Friends concert at ACL Moody Theater on April 25th. Event will take place at 8:00pm. For more info, visit http://mackjackmcconaughey.org/ for ticket information.